On how to detect the invisible material relations and interventions and subsequently making them visible. Fablabs (fabrication laboratory) are cooperative work spaces where inventors and artists work together using a collective infrastructure. You can find Fablabs all over the world. Last week I was given an introduction of the machines in our own HvA makerslab. It is great to see what the possibilities are of this work space; 3D printer, laser cutter, body scan, vinyl cutter and more. We used all the machines to find out what the opportunities are for our CMD students. Coincidentally I coach Anne Vlaanderen during her graduation at CMD and she is graduating in cooperation with the Fablab de Waag Society. Together with the two other graduate students I coach, Alexander Eerenberg and Joris Bijsterveld, we visited Anne at the Waag where she gave us a tour. The Waag is a 15th century castle on the Nieuwmarkt 4 in Amsterdam. The building has an amazing atmosphere and the Waag Fablab is located in one of the four towers. Anne is the expert when it comes to using the different machines and she has great creative ideas. She is also the initiator of Digituig, an organization that “focuses on the development and implementation of digital creativity in primary and secondary education“. We had an amazing time at the Waag! Who ever wants to work with the machines of a Fablab reserve a machine on their website during one of the open days. Working at a Fablab is free of charge, what you give back is information about your work at the Bablab. In an earlier post called “Participatory Street-up Innovation” I wrote about how invisible material relations and interventions could be detected and made visible. And that this creative process from invisible to visible would be a role for artists. A great example of visualizing an invisible or abstract process is the interactive artwork “Boundary Functions” (1998) by Scott Snibbe. The artwork shows people walking on a raised floor and projected lines between them which makes visible how personal space and relationships changes between these people. Snibbe: “Personal space, although we call it our own, is defined by others and changes without our control.” Interdependence and the social construction of reality, are the themes that can be found throughout all of Snibbe’s artwork. 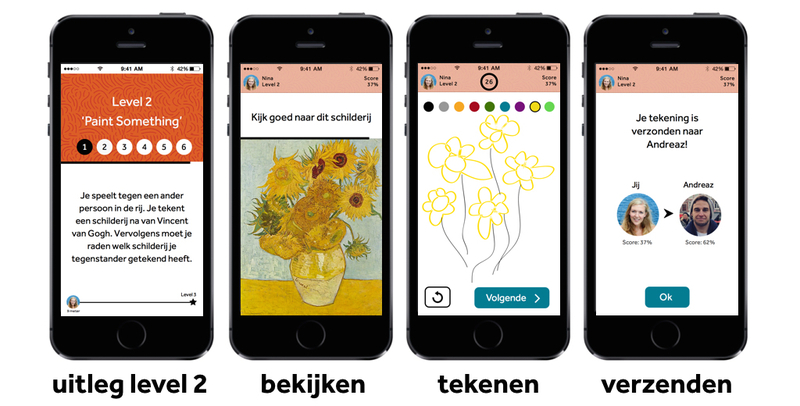 One of our CMD graduates of 2015, Marjolein Fennis, created an amazing game for the Van Gogh Museum. People can play the ‘Waiting for Vincent’ game while they are waiting in line in front of the museum. You can read about the game on the Lava Lab website, where Marjolein worked as an intern. Together with Lava Lab and the Van Gogh Museum Marjolein is now looking for ways to execute this project, within the framework of the new storytelling platform Flinck. Go and have a look at ‘Waiting for Vincent‘, the experience before the actual experience! Together with my colleague Rob Prass I went to Pakhuis de Zwijger, where ‘Play the City’ is located, with no specific expectations. After a very friendly welcome we first had to pick an envelope which contains our budget and some rules, next we had to carefully plan and design our area in the Almere Oosterwold project. 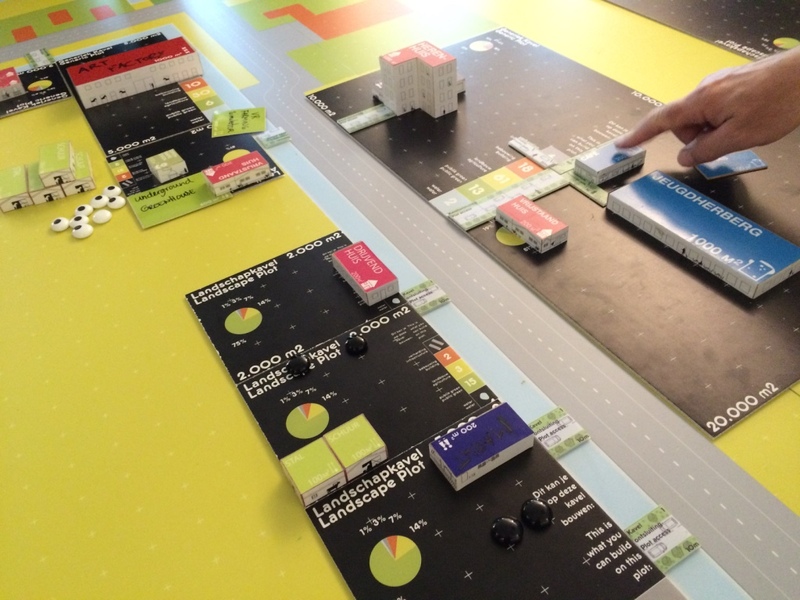 My cooperation with Rob worked out very well, at least we thought so :-), and after we had bought and carefully positioned our roads, bridges, buildings and energy resources we evaluated what happened during the game itself. It was very interesting to see how people worked together, made deals, supported each other, designed creative concepts and so on. However, as in real life, there were also disappointments, distrust and (friendly) break ups. After a passionate review we could only conclude that we all had a great afternoon with unexpected insights and fun! Many thanks to the people of ‘Play the City’ for their guidance and support during the (fantastic designed!) city game and the opportunity to participate! When you’re interesting in playing the city game don’t hesitate to contact the people of ‘Play the City’. In the video a talk by Ekim Tan on the reason why she founded the ‘Play the City’ game. It is interesting to hear how he views globalization as repeating the same everywhere as opposed to dealing with diversity. Kounellis: “We [artists and designers] should listen and participate without interrupting the relation established by the people with the land.” In this light he prefers Picasso when he compares him with Mondriaan because it is Picasso who let’s himself be influenced by war in his work [literally by painting Guernica] and Mondriaan doesn’t use the bombing of London in his work. Even though I agree with Kouneliss idea of respecting diversity I wonder whether the work of an artist who follows his personal path of investigation, whose work is separated from events in society, participates less in society than an artist who does? Living in his studio that looked like one of his paintings, Mondriaan wants to reveal what has always been there, what he sees and what others don’t see, a world of perfect balance. As a consequence of this idea a balanced world wouldn’t need art because we would be living in art. In this sense it is not surprising that realism for Mondrian was out of the question because realism for Mondriaan is to fall back on the existing visible world which is in unbalance. However Mondriaan isn’t a pessimist, although he considers art in his time as being in isolation, art will eventually reunite with life. I can imagine that the work of an artist who responds to events, globally or locally, has an obvious link with society. But the work of Mondriaan, as an investigation on understanding the world, represents his idea that (abstract) art equals living. Finding and visualizing this perfect balance through art would show the structure beneath our world to the world. And although Mondriaan refers to the world as a linear system in his work and not so much to the systems of societies, I think Mondriaans work of perfect balance can be used to show unbalanced processes that are still invisible in society. Mondriaans work is a canvass of life striving for balance which therefore can operate as a reflection on the events occurring in our society and personal lives. As Picasso painted the result of war in all its immensities, Mondriaan tried to construe the system or rhythm of a balanced world that would overcome an unbalanced life that leads to catastrophic events. The latter takes time to understand, as Mondriaan was well aware of. Re-reading my hypothesis on the transformative potential of ‘participatory street-up innovation’ I think a few important anchors in my thought process are missing. First I have to define the term ‘innovative’, if only because in recent years this term has become a huge hype for several branches, especially in the world of design. My idea of innovative stands for ‘ahead of the times’. In other words people can re-use products in an unobvious and contemplative way. Second, I talk about issues without addressing how issues come into being. I think that issues mostly stem from the disruption of daily life by events out of our reach (from bad weather to war). Moreover it is in the way how people respond to the disruptive event that will create and define personal and public issues. The latter arises when large groups of people start participating on the issue. This is just a first thought on the question how public issues come into being and not an answer to the question by far. Third, by focusing on the re-use of products I limit the findings about unobvious and contemplative ways of dealing with material circumstances too much. This is because a product might only function as a tool during the process of creativity when people create things. The re-use of products might be confined to the product itself and will show nothing about the disruptive event, issues and material circumstances I am interested about. That’s why I want to broaden the focus on the re-use of products and the things that people make to material relations and interventions. Unfortunately material relations and interventions constitute a long-term process that in the beginning might be invisible. I hope to find out how to detect the invisible material relations and interventions and subsequently making them visible. I think this would be a role for artists. (more on this later) In this creative process from invisibility to visibility their might be the trans-formative potential in street-up innovation which I wrote about earlier. So reconsidering the hypothesis on Participatory Street-up Innovation (PSuI) the question I want to investigate is how to detect (and visualize) material relations or interventions and the issues they bring about. This is necessary to discover the ideas stemming from material participation in daily life before, during and after disruptive events. In this way I hope to gain insights on how people deal with the complexity of the world and its issues.